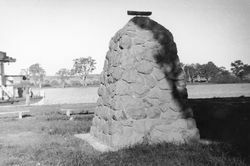 A cairn commemorates the centenary of Captain Charles Sturt`s exploration of the River Murray. In 1830 Sturt`s expedition rowed down the Murray and on 9 February reached Lake Alexandrina where they walked over the sandhills to the southern coast. They reached the channel where the lake entered the sea but were dismayed to find it impracticable for shipping. Depressed by failing to find either an effective inland waterway or the ship which Darling had promised to send from Sydney, Sturt now faced the appalling prospect of rowing more than 900 miles (1448 km) against a strong current with his weary men and certain food shortage. They began the return journey on 12 February and on 23 March arrived at the Murrumbidgee depot only to find it deserted by the base party which had been left there. The starving crew struggled on until 11 April when Sturt abandoned the boat and sent two men to seek the relief party which he believed to be near. A week later the two men returned with supplies and the revived expedition reached Sydney safely on 25 May. 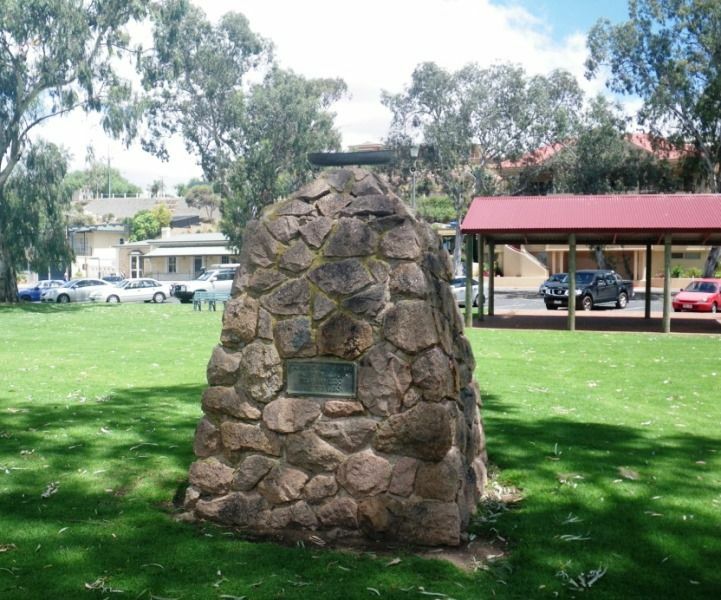 On Friday afternoon, January 17, the Sturt Centenary Memorial Cairn was unveiled in the presence of a large crowd. 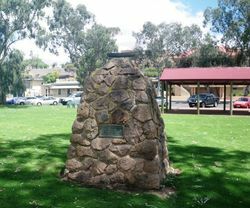 The cairn, which is situated on the Recreation Ground, near the Randell Memorial Bandstand, is a handsome and solid structure. 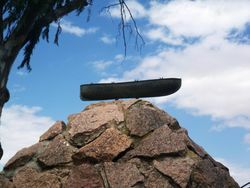 It is built of granite, with a cement base, and its measurements are:—Base, 7 ft, rising to 4 ft. at the top, and 10 ft. high, and is surmounted by a bronze whale boat 2 ft .6 in. long. 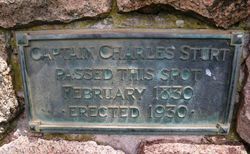 On the eastern side, facing the river, is a tablet containing the following inscription:— "Captain Charles Sturt passed this spot February 1830. Erected 1930." The Mount Barker Courier and Onkaparinga and Gumeracha Advertiser (SA), 24 January 1917.